Medium: original lithograph. Published in Paris by Maeght for Derriere le Miroir (No. 131) in 1962. Sheet size: 15 x 22 inches. There is a center fold and text on verso, as issued. Not signed. 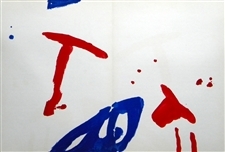 Pierre Tal-Coat original lithograph "Oiseau et son ombre"
Medium: original lithograph. Executed for the 1964 special edition of Derriere le Miroir (No. 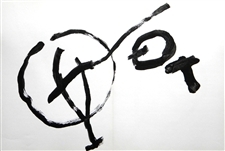 144-145-146) devoted in homage to Georges Braque, and published in Paris by the Maeght atelier. The total sheet measures 15 x 11 inches (380 x 280 mm); there is text on verso, as issued. Signed by Tal-Coat in the plate, not hand-signed. Medium: original lithograph. Published in Paris by Maeght for Derrière le Miroir (No. 131) in 1962. Sheet size: 15 x 22 inches. There is a center fold and text on verso, as issued. Not signed. Medium: lithograph (after the drawing). Published in Paris by Maeght for Derrière le Miroir (No. 120) in 1960. Sheet size: 15 x 22 inches (380 x 560 mm). There is a center fold and printed text on the back, as issued. Signed by Tal-Coat in the stone (not by hand). Medium: lithograph (after the drawing). 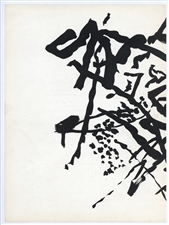 Published in Paris by Maeght for Derrière le Miroir (i 120) in 1960. Sheet size: 15 x 22 inches (380 x 560 mm). There is a center fold and printed text on the back, as issued. Signed by Tal-Coat in the stone (not by hand). Medium: lithograph (after the drawing). Published in Paris by Maeght for Derrière le Miroir (No. 120) in 1960. Sheet size: 15 x 11 inches (380 x 277 mm); there is printed text on verso, as issued. 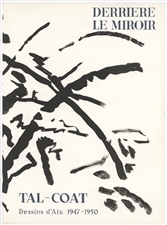 Signed by Tal-Coat in the stone (not by hand). Medium: lithograph (after the drawing). 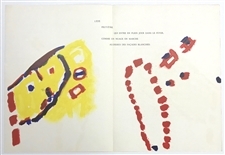 Published in Paris by Maeght for the back cover of Derrière le Miroir (issue number 120) in 1960. Sheet size: 15 x 11 inches (380 x 277 mm); there is printed text on verso, as issued. Not signed. Medium: lithograph (after the drawing). 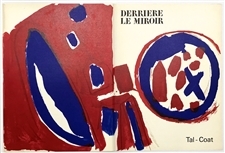 Published in Paris by Maeght for the front cover of Derrière le Miroir (issue number 120) in 1960. Sheet size: 15 x 11 inches (380 x 277 mm). Not signed.